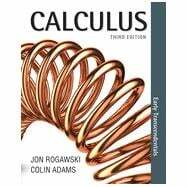 The most successful calculus book of its generation, Jon Rogawski’s Calculus offers an ideal balance of formal precision and dedicated conceptual focus, helping students build strong computational skills while continually reinforcing the relevance of calculus to their future studies and their lives. Guided by new author Colin Adams, the new edition stays true to the late Jon Rogawski’s refreshing and highly effective approach, while drawing on extensive instructor and student feedback, and Adams’ three decades as a calculus teacher and author of math books for general audiences. W. H. Freeman/Macmillan and WebAssign have partnered to deliver WebAssign Premium – a comprehensive and flexible suite of resources for your calculus course. Combining the most widely used online homework platform with the authoritative and interactive content from the textbook, WebAssign Premium extends and enhances the classroom experience for instructors and students. Macmillan Learning and WebAssign have partnered to deliver WebAssign Premium – a comprehensive and flexible suite of resources for your calculus course. Combining the most widely used online homework platform with authoritative textbook content and Macmillan’s esteemed Calctools, WebAssign Premium extends and enhances the classroom experience for instructors and students. Preview course content and sample assignments at www.webassign.net/whfreeman. Jon Rogawski received his undergraduate degree (and simultaneously a master's degree in mathematics) at Yale, and a Ph.D. in mathematics from Princeton University, where he studied under Robert Langlands. Prior to joining the Department of Mathematics at UCLA, where he is currently Full Professor, he held teaching positions at Yale and the University of Chicago, and research positions at the Institute for Advanced Study and University of Bonn. Jon's areas of interest are number theory, automorphic forms, and harmonic analysis on semisimple groups. He has published numerous research articles in leading mathematical journals, including a research monograph entitled Automorphic Representations of Unitary Groups in Three Variables (Princeton University Press). He is the recipient of a Sloan Fellowship and an editor of The Pacific Journal of Mathematics. Jon and his wife Julie, a physician in family practice, have four children. They run a busy household and, whenever possible, enjoy family vacations in the mountains of California. Jon is a passionate classical music lover and plays the violin and classical guitar. Colin Adams is the Thomas T. Read Professor of Mathematics at Williams College, where he has taught since 1985. He has produced a number of books that make mathematics more accessible and relatable, including How to Ace Calculus and its sequel, How to Ace the Rest of Calculus; Riot at the Calc Exam and other Mathematically Bent Stories; and Zombies & Calculus. Colin co-wrote and appears in the videos "The Great Pi vs. E Debate" and "Derivative vs. Integral: the Final Smackdown." Adams received his undergraduate degree from MIT and his Ph.D. from the University of Wisconsin. He had held various grants for research in the area of knot theory and low-dimensional topology and has published numerous research articles. He received the Haimo National Distinguished Teaching Award from the Mathematical Association of America (MAA) in 1998, and the Robert Foster Cherry Teaching Award in 2003. Adams also served as MAA Polya Lecturer (1998-2000), and as Sigma Xi Distinguished Lecturer (2000-2002).